Born in Burton on Trent, Maurice Millard was the son of Leicester’s long-serving Medical Officer of Health Dr C. Killick Millard (Lit & Phil President for 1917-18). Educated at Bradfield and Birmingham University he was a long-serving general medical practitioner in Leicester. In his younger days he was a noted rugby player with the Leicester Tigers and also the Leicestershire County rugby team. 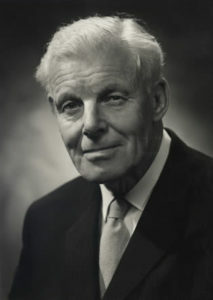 In 1984 he made an extended audio recording for the East Midlands Oral History Project in which he describes the work of himself and his father, who was Medical Officer of Health for Leicester between 1901 and 1936. Topics covered include the need to improve housing and sanitation conditions in Leicester’s slum areas and the battle against alcohol abuse, the need for Family Planning, church opposition to this and the ignorance surrounding contraception and abortion. He also talks about the control of smallpox and how the improvement in social conditions helped the decline in infectious diseases, the benefits brought by the arrival of the National Health Service (NHS) in 1948, the effects of the introduction of antibiotics, and the changes in medical diagnosis. Address of the President [on the role of the General Practitioner] Trans. LLPS, vol. 62, pp. 5 – 12.